website On any given day, a Mission Trails Regional Park visitor may encounter a common poorwill — if he/she can spot it! This nocturnal bird sleeps on the ground during the day but its cryptic plumage offers the perfect camouflage to the human eye. At night, a flashlight might pick up its glowing eyes on the trail, making it more visible. But by then, the bird may already be up in the air on a feeding raid, catching night flying insects. buy now In this iNaturalist observation by klyle161 (bit.ly/2VkHBzm), the poorwill was apparently feeding during a reasonably warm winter night. Often in winter however, when the temperature drops and insects on the menu may be scarce, the common poorwill exhibits a very interesting behavior. The bird will go into what is called torpor, a hibernation-like state where the animal’s metabolic rate slows down drastically to save a certain percentage of its daily energy requirement. https://mediaspectrum.net/healthcare/ order now Torpor isn’t unique to the poorwill. Other birds, such as hummingbirds, will also go into a state of torpor. A hummingbird’s metabolism is extremely fast and the only way it can survive the night without feeding is by slowing it down dramatically by going into torpor. In the hummingbird, that state is induced by darkness. Some species of doves and pigeons can go into torpor when food is hard to find, but the state will not last more than a few hours for those feathered friends. 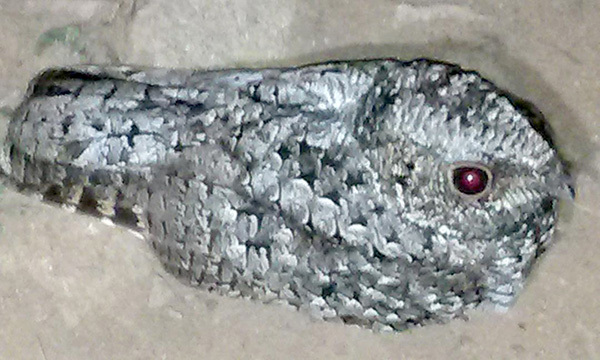 The common poorwill is unique because the torpor may last for weeks at a time, allowing the bird to survive without food for a long time. Both low temperature and food scarcity may play a role in inducing the state. The San Diego Humane Society’s wildlife rehabilitation program, known as Project Wildlife, intakes common poorwills every winter brought by kind citizens concerned about their well-being. In most cases, the birds are perfectly healthy; they just hit that snooze button on repeat (a life-long morning dream of mine!). Unless there are signs of trauma (head or wing out of place, blood), they are better off left alone. — Patricia Simpson is a trail guide at Mission Trails Regional Park. iNaturalist is an online social network of people sharing biodiversity information to help each other learn about nature.